What, you think I’m gonna chicken-out and NOT dance? I was nervous as heck getting up there, but I’m glad I did. Like I said, I’m a beginner. So Anthrocon 2014 is pretty much done on SUnday night after the Dealer’s Room is closed, and everybody wants to get in their last partying on with friends, before going back home on Monday morning. So people will go to the ‘zoo'(meeting place/hangout area) and meet people, party a little while longer. There’s a subset of the furry fandom, called dancer furs. At most conventions nowadays, there will be a fursuit dance competition. It’s exactly what it says: dancers in fursuit compete against each other! It’s all done in fun, in community, and in support and encouragement to each other, no matter what level you are! I’m DEFINITELY a beginner! So back to Sunday night, a dance cypher was announced, so I wanted to check it out. Lots of talented people there, including my friend Theome. Just as he’s about done with his turn, he mentions to ME to get up and dance! What do I do?? Find out next week! Also, if you have been enjoying the comic, and you would like to show support in a monetary way, I will be starting up a Patreon shortly! Details to follow! So after a nutty drive, I made my infamous grilled cheese (which was later utilized at ‘DadCon’ as the ‘buns’ for cheeseburgers!!). We attempted to watch The Young Ones on DVD, but I was completely shot after working earlier that day and driving there, that we got the last panel that you see here! I didn’t even make it past the first episode! We had just finished doing a mascotting gig, when we decided to go there for food and drink. It’s a nice place! Here’s the actual badge that I drew for Tarder! Annnddd here she is!!! SO ADORABLE and SMALL!! Totally and completely worth it. After an unplanned vacation from posting for 4 months, me & DTI2.0 are back! For the time being, iamjoemeyer.com is still under construction until further notice. I will let you all know when it’s back. 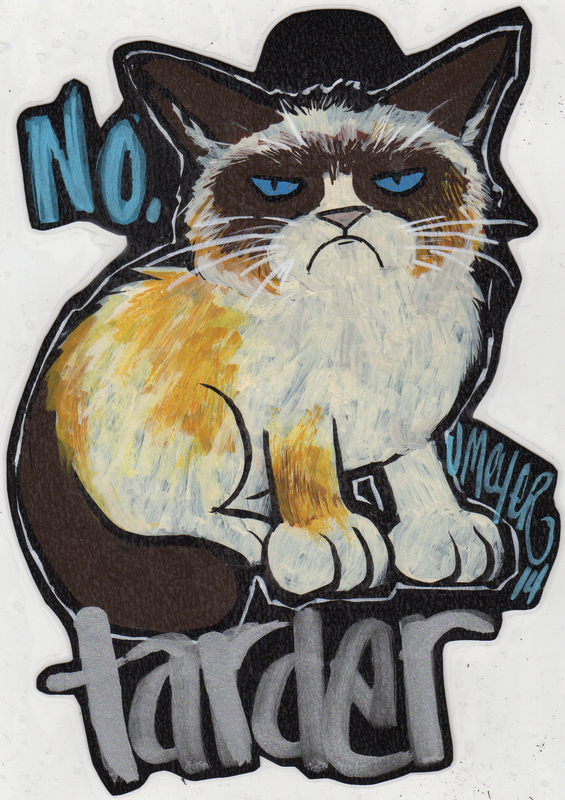 And so, we continue with the saga of meeting Grumpy Cat! Waiting all that time, fielding questions from haters, and more employees of Chronicle Books! See y’all next week! Also, some big things coming soon! How cool is that? I got a free copy of the new book that wouldn’t be out until 3 months later! And YAY! My buddy Rory arrives! My partner in crime in kitty geek-age! We were soooooooo excited! So I get there, expecting a LOT of people there waiting, AND THERE’S NOBODY THERE. I could NOT believe it. I’m just some regular guy who’s a fan of a internet famous kitty. How could I possibly be the first in line? Soon things would get even more awesome! Almost a year ago, I attended BookCon with the sole purpose of meeting the infamous Grumpy Cat! It was awful. I had a plan, get there early, and get on the crazy line that there was going to be, and wait for a chance!